Aroids of the imagination III - What's swimming around down there? Delving into the depths of the vast Aroidian ocean is an adventure that would test even the mettle of Jacques Cousteau! Fortunately for me, voyaging in my imagination provided me all the safety I required. From giant swaying seaweed-like ribbon forests to the object of my adventure, the aquatic sentient aroids, this search was bound to turn up something interesting. And it did . . .
On Earth, some plants in the genus Cryptocoryne are popular and eminently suitable for use in aquarium settings. These aquatic aroids, also known as water trumpets, come in a variety of shapes, sizes, and colors. They range from the easy and versatile growers to those difficult even for experts. On Aroidia, however, forests of Ribbon Trees form immense waving fields in the underwater landscape. These giants, whose inspiration was Cryptocoryne, appear more like giant kelp (Macrocystis) than anything else. Their fleshy root systems anchor them firmly to the rocky ocean floor of Aroidia, and their wide wavy leaves extend out into the ocean more than 200 meters. The pollenoids of the Ribbon Trees (illustrated at right) dart around in groups almost like schools of fish, but instead of hunting for food they are searching for receptive inflorescences! These pollenoids are guided to their targets by specific organic ions emitted and dispersed by the receptive pistilloids. The ribbon forests provide ideal resting places for the terrifyingly beautiful sentient denizens of the deep, Triklados sapientum. These entities, whose name means "three-branched wise one", are to their genus what Homo sapiens is to the primates. T. sapientum is dioecious, meaning males and females grow as separate plants. Unlike many others of the Aroidian flora, these entities do not produce motile pollenoids, as they themselves are motile. Therefore, one of the reasons they seek each other out is to engage in the process of sexual reproduction. Illustrated at left is an example of a femaie T. sapientum. 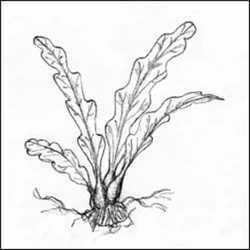 The motile roots, or rhizoflagellae, whose bases only are shown in the picture, extend out from the main body at least three body lengths. 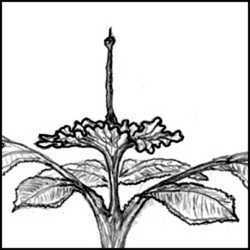 This specimen "sees" with the radiation sense organs seen on the stalks that arise from each leaf midrib. These eye stalks are receptive to a much wider band of the electromagnetic spectrum than our eyes, so the view is extraordinarily rich in colors. The swollen base of the plant is where both the reproductive organs and the central nervous ganglion or "brain" are located. Vascular nerve fibers run up from the ganglion to the eye stalks and down to the contractile tissue that causes the rhizoflagellae to undulate. A structure similar to the style of an Earth flower runs from the ovaries to the receptive bulbils located at the area where the three "leaves" come together. The three receptive bulbils serve the same function as the stigma on an Earth flower. However, the overall structure is actually aroid-like in that the external or vegetative part of the plant is analogous to the spathe, while the internal reproductive organs and channel are analogous to the spadix. The genus Amorphophallus was the inspiration for the entire Aroidian genus of Triklados. 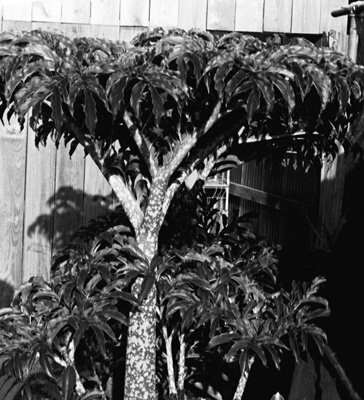 In fact, had I been the explorer who discovered the first specimen of Amorphophallus, I might have named it Trikladophyllum because each leaf has three primary "branches", or divisions. This leaf structure can be seen clearly in the photograph below. Amorphophallus vary in leaf size, texture and color. The inflorescences, too, are widely variable. All Amorphophallus arise from underground tubers. and many of them have a dormant period between vegetative or reproductive cycles. Amorphophallus plants always captivated my interest, because the emerged leaf looks like an alien tree. However, the apparent "leaves" and "branches" of this "tree" are only parts of a single large leaf! The alien look extends to the blooms as well, some inflorescences having shapes that defy description, while others are much more obviously phallic. This fact is probably the reason the genus was named "Amorphophallus". Back on Aroidia, I never visualized T. sapientum with an inflorescence; the reason for this is quite startling. Each entire specimen is, simultaneously, vegetative and reproductive, meaning that the bloom is the plant, and the plant is the bloom. As such, they are always in leaf, and always in bloom. As mentioned above, the entire body structure is akin to a spathe and spadix, with the spathe assuming all of the vegetative function that would normally take place in a separate structure. Both mature males and mature females are fertile at all times, but they exercise amazing restraint in that the Aroidian ocean is not overpopulated with them. They seem to know when reproduction is most beneficial for the entire ecosystem, which illustrates one aspect of their profound intelligence. T. sapientum is the only intelligent species of Triklados, although a number of other species can be encountered on Aroidia. 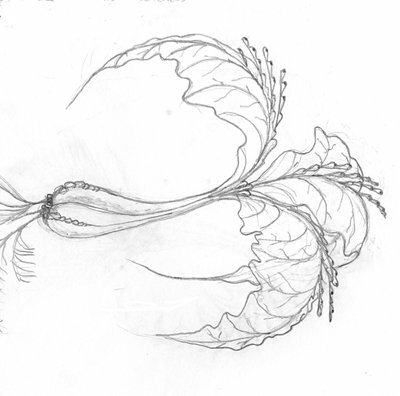 One other aquatic species is saprophytic, with a leaf modified as a snare to capture and digest floating organic matter. Most of the other species are found growing on the biological archipelagos, some as massive trees reaching 100 feet or higher. One of those actually produces a woody core, or dendrostyle. This lignified structure supports the growth of three shoots that arise from a huge tripartite underground tuber. These dendrostyles have rings much like trees on Earth, but no woody branches. A closely related genus, Pentaklados, has an appearance akin to a weeping tree on Earth due to the denser branching, smaller leaflets and gently drooping main leaf divisions. The "male of the house"
At left can be seen an example of a male T. sapientum. This specimen has much the same structure as the female does, with the major exception being the reproductive organs. The male produces non-motile pollenoids that are ejected through a tube analogous to a very elongated anther chamber. Pollenoids are ejected only when in close proximity to a receptive female. The male must maneuver skillfully and precisely to insure that the pollenoids will hit their mark when fired. This behavior demonstrates yet another facet of the intelligence of T. sapientum. Note that eye stalks on the males are more numerous and studded with more eyes than those found on the females. One reason for this is to aid in the precise targeting of the pollenoids. Additionally, the male has several kinds of rhizoflagellae as well as many more of them overall. Again, this allows the male greater maneuvering precision. 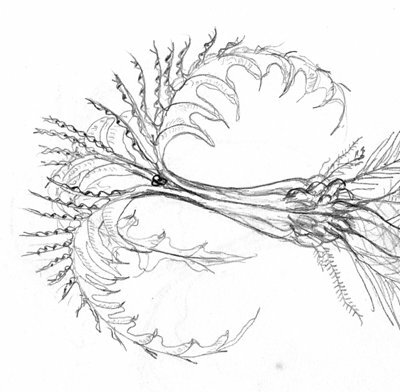 The bodies of these plants are 15 to 20 feet long, excluding rhizoflagellae, and the span of the leaves is 20 to 25 feet, making these plants quite imposing when moving around in the ocean. They are the largest motile organisms on Aroidia. Further imaginative exploration showed me that Triklados is both the most diverse and the largest genus on Aroidia. 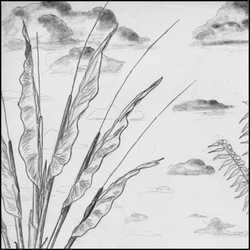 I was anxious to visualize more of these fascinating plants. The search for them brought me back onto the biological archipelagos, where I was positively stunned by one particular specimen I found . . .